The Paralympics have started with a bang for the British squad, with a brace of golds in the bag already. The 2012 Games have helped us to really focus on the way that disability doesn't make you helpless, or unable to achieve greatness. The 2012 ParalympicsGB squad has a particularly strong showing from ex-servicemen and women that have been wounded in Afghanistan and Iraq. For these brave men and women, staying active and strong is especially important. That's why Pier32 were happy to help out Kartforce, an organisation dedicated to giving disabled ex-soldiers a chance to enjoy an adrenaline-packed go-karting experience. They've devised an innovative series of hand controls that allow a fine degree of control without having to worry about pedals. Kartforce also raise money for charities that help out injured ex-Forces personnel, working hard to provide a legacy of support for our heroes in their time of greatest need. Drivers using Kartforce-supplied vehicles have just set a Guinness World Record for most distance covered in 24 hours. That's an amazing achievement, and one that makes Pier32 proud and happy to help them out with a stack of t-shirts. Kartforce's next event will be at Rye House in Hertfordshire on Saturday, September 8th, and we hope to have an eye on the ground to report back on all the action. For now, if you'd like to know more about Kartforce and their work, check out the website. It's easier than ever, and at the same time more difficult, to read appropriately around the subject of ethical fashion. There are all kinds of blogs and online reading resources for the curious reader to explore (including, I hope, our own humble efforts). But if you want to find something with a bit more depth and heft--well, that can be a bit more tricky. Here at The Pier we are indebted to Pamela Ravasio, whose Shirahime blog is a favourite of ours. She's tenacious at finding decent books on the subject and making sure they get our attention. The problem, as Pamela points out with the weary tone of someone that's seen it far too often, is that books on ethical fashion tend to only be available in their home market--an interesting phenomenon for a subject that is, at its core, concerned with the negative effects of globalisation. With that in mind, I'd like to focus on a couple of books that are (or soon will be) available in the Pier's home market, the UK. Both are very worthy of your attention. To Die For--Is Fashion Wearing Out The World? comes from Lucy Siegel, the green correspondent for The Guardian. It is, as you'd expect, impeccably researched, and substantial. But it's also cleanly, concisely written and extremely accessible. There's little point in turning a potential convert off with impenetrable language and a screed of tables and graphs. To Die For doesn't do that. Instead, Lucy carefully allows us to relate the contents of our wardrobe to the bigger picture. The book takes on everything from the rise of fast fashion and it's ethical and environmental impact, to the simple things we can do as consumers and concerned citizens of the planet to lessen that blow. Heartily recommended. Meanwhile, Elizabeth Cline's Overdressed: Responsible Shopping In The Age Of Cheap Fashion does much the same, but tweaked for an American audience. I'm not saying she dumbs it down--far from it. Overdressed is every bit as smart and well-informed as Lucy Seigel's book. But Elizabeth's approach is lighter and less condemning, focussing on the positives. For example, she visits the only living wage garment factory, and treats the story of a move away from fast fashion as more of a personal odyssey. The hard truths are in here, but they're designed to be more of an impetus for change than an indictment of consumerism gone riot. It's as affable and charming as you'd expect from a book about globalisation. I think both books are great both as primers to the state of the ethical fashion world, and as an eye-opener into the practices and abuses that made it necessary. You could do worse than add them to your summer reading pile. To Die For--Is Fashion Wearing Out The World? by Lucy Seigel is available now. Overdressed: Responsible Shopping In The Age Of Cheap Fashion by Elizabeth Cline is released at the end of the month in the UK. Who remembers RingPops? They were (in fact they still are) pieces of chunky, garish jewellery made of fruit flavoured hard candy. Wearing a Ring Pop was the only time until the rap era that boys could get away with wearing outrageously huge diamond rings. Finding a girl that was willing to have a lick on it was, of course, an extra added bonus. I digress. I have a feeling that Young Ju Do, a recent graduate from the Central St Martins School Of Art And Design, has at least a passing recollection of the fruity, wearable treats of yore. The aim of her MA project was to create a range of home-compostable jewellery and accessories. The end results are dayglo-colourful and lots of fun. They look like rave-style resin pieces. But the comparison with Ring Pops becomes clearer once Ju explains that she's created the pieces from edible materials. Containing a balanced mix of "brown" and "green" bio-material, once you're done with your jewellery they'll make a yummy treat--not for you, but for the micro-organisms and bugs on your compost heap. The pieces are designed to break down and provide sustenance for a wide range of bugs and helpful bacteria, helping your garden to flourish. Ju's work is deeply informed by cradle-to-cradle theory. She wants to help create a new kind of throwaway culture, where products have a second life outside the retail cycle. It's a well-thought-out and beautifully executed project, and Ju's jewellery is funky and charming. She might want you to throw the pieces onto the compost heap, but I have a feeling that the discerning green fashionista will want to hang onto them. And, unlike Ring Pops, they're not going to go sticky in your pocket and collect fluff. For more, check out Young Ju Do's website. The London 2012 Olympics came to an end last night, the flames in the cauldron flickering out as Take That serenaded a packed stadium. It has been a remarkable, massively successful Games on every front. But what have we learned? Well, we've learned that War On Want know how to pull off a direct action, as they fired a projection onto a building overlooking the Olympic Park. A triumph, and one that must have had Adidas executives screaming with rage. We found out that Fairtrade has a high profile supporter--none other than one of the most highly decorated Olympians of all time, Sir Steve Redgrave. He has a clothing line, FiveG, that uses organic cotton sourced from Mali. The word on everyone's lips following the Games is legacy. How do we take the vast amount of good will and positive energy generated by the Olympics and convert it into something lasting, of real worth? I'd argue that what we have seen over the past fortnight is the first working example of David Cameron's Big Society in action. 70,000 volunteers, working selflessly and with good humour for the greater good. Now, it might be a bit more tricky to persuade people that clearing an old bit of brownfield to make a park or allotments is as much fun as being at the Games, but I can pretty much guarantee that Olympics GamesMakers are the kind of Britons who will wake up this morning and think "Right. What's next?" The trick for the Coalition now is, just this once, not to fumble the ball or trip over their own feet. Community projects have the people and the will in place, more now than in any time in the past couple of years. With a bump in funding, Cameron could find his pet initiative will suddenly take off and fly. Don't make me tell you how easy it would be to find the cash. If we want to have a real legacy from these amazing two weeks, then let's do better than compulsory team games in school. Let's take the example of the selfless volunteers who received the biggest round of applause at both the opening and closing ceremonies of the Games. Let's make the volunteer sector a real force for good in this country, and put together a legacy that really could inspire a generation. It's pretty much a year to the day that The View highlighted Oat Shoes, an innovative Dutch brand of biodegradable shoe that you could bury in your garden when you were done with them. It's taken a while, but other manufacturers are starting to seed the market with their own takes on the idea. The biggest of them all is Puma. The global brand is making big steps to be seen as greener, revealing their first environmental profit and loss account in November. As a way of showing good faith in their aims, they launched the Re:Suede, their most sustainable shoe yet. Based on the classic design embraced by 70's B-Boys, 80's rappers and 90's indie kids, the Suede is instantly recognisable. But the shoe has been rethought from the ground up with an eye to sustainability. The upper, sock liner, laces and sub lining are all made from completely recycled material. The sole is made from an innovative new material that mixes rubber with rice husks, saving energy both in production and transport costs. Speaking of which, the whole shoe is much lighter than the original, cutting down on emission costs. Puma estimates that 15 tons of carbon emissions will be saved with every 10,000 pairs of Re:Suedes shipped. They're even shipped in bags instead of boxes, lessening the impact still further. The Re-Suede shoe is a great example of how to recreate a classic brand and bring it bang up to date. It'll be interesting to see how easy it is to get hold of them in the shops, although they do seem to be easily available online and at posh trainer stores like Size? But this isn't the only big news from Puma. In a recent interview, CEO Franz Koch announced the launch of a new line of completely compostible shoes and clothing, likely to drop next year. It looks like the Oat Shoe model of throwing your kicks on the compost heap instead of in the bin is getting closer to becoming the norm. The following has been crossposted, with minor alterations, from my main blog, Excuses And Half Truths. I write there about SF, horror, comics, food and film. Do drop in if any of the above interests you. Sometimes, you just get lucky. Fate, which so often conspires against you, shifts the balance in your favour. Just for a little while. As long as you're aware of it, then fate can give you a moment that you will treasure for a very long time. 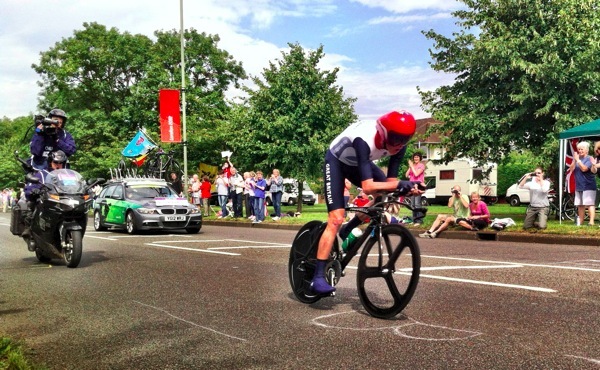 The other day, fate put me close enough to the legendary Bradley Wiggins to feel the slipstream as he rocketed past. And that was just one part of an amazing, dizzying day. Contrary to popular opinion, your humble writer does not live at the end of a pier jutting out into the river Thames, fed by Guru Ian on fish and the occasional beer if I've been a good boy. I live about an hour's drive away, in a house by a cemetery on the borderlands of three different counties. 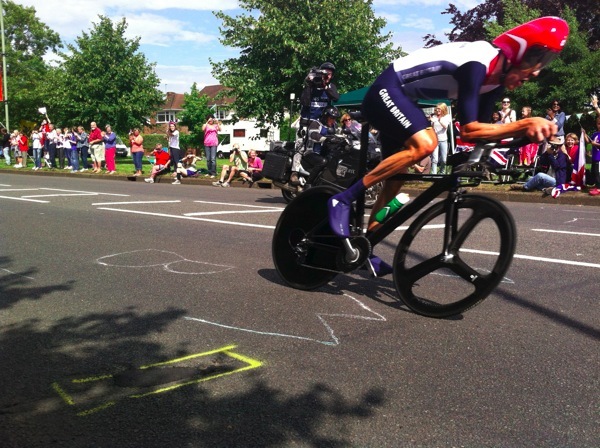 The company, and the homes of Ian, Super Sandi, Gerry the Voice and Ali the Mascot And Future Boss is sunny, charming Thames Ditton, This just so happens to be a spit and a whistle away from the Olympic cycling time trial route, which winds through Hampton Court and Kingston. We (that is, yr. humble writer and his delightful wife TLC) invited ourselves over, hoping we might catch a glimpse of the action. Readership, we had no idea. Ian and Sandi's gaff is a two-minute walk from Hampton Court Way--part of the course. Better yet, it was quiet enough that we could set up comfortably right on the roadside. With a set of folding picnic chairs in tow, we had the sort of grandstand view that people wouldn't get if they paid big bucks for a ticket by the finish line. We made the sensible decision to sleep over the night before, knowing that the roads around the course would be closed from early morning. It was wise indeed. We had a chance for a leisurely breakfast, a jug of coffee, and a morning in front of Ian's big fat telly, all the better to enjoy the rowing. Which meant, of course, that we had time before wandering down to the trackside to watch Heather Stanning and Helen Glover win Team GB's first gold in the sculls at Eton Dorney, maybe ten miles away from Thames Ditton. A remarkable achievement, carried out with aplomb and cool style. We jumped up and down and whooped as the girls swooped onto the finish line, nearly a length ahead of everyone else. I had no idea that most of the Olympic rowers are based just up the road from our house in Caversham. Another source of pride. Already euphoric, we headed down to Hampton Court Way, where the neighbourhood had set up gazebos and flags. We were literally at roadside. A burly, cheerful Olympic steward paced up and down, keeping us updated as to who was off first and next. The poor guy could have done with a megaphone. He was seriously husky by the end of the day. Suddenly, he bellowed at us to stand clear, and just like that, the race was on. Every ninety seconds, a police bike swished past (occasionally offering a wave to the punters) followed by the riders. Sleek and bullet-quick in shiny lycra and stormtrooper helmets. Unsmiling, except when they caught sight of a national flag. Which should have meant that Liz Armitstead and Emma Pooley would have been grinning all the way round. It was hard to tell. They were moving that fast. But every inch of the ride was thronged with union flags and people like us, roaring our lungs out, willing our girls to glory. Sadly, all our screams and yells and flag-waving weren't enough to get them onto the podium. An amazing effort, but we knew that wasn't the end of it. Back to home base, a snack and a look at some more rowing, before we were back at the roadside for the men's time trials. By now the threat of rain had passed, and Hampton Court was bathed in sunshine. Our friend with the foghorn voice paced up and down. Kids scrawled encouraging messages on the road in chalk. I settled back in a fold-up chair, in a nice clear spot, lined up my camera for the perfect shot and waited. There were twice as many male riders, but the line-up seemed to go just as quickly. To be brutally honest, although we cheered and clapped dutifully, we were only there for two reasons, and they were close to the end of the pack. 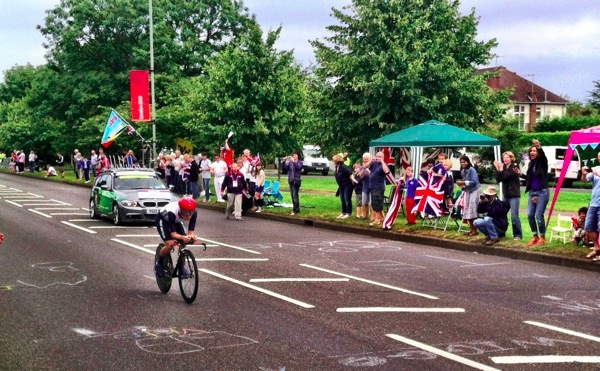 The cheers as Chris Froome span past were easily twice as loud as for the rest of the pack. There was only one man who could top it, and he rocketed past ten minutes later, to a fanfare of yells and shouts. The guy was moving. Look at the pic. He's bending light. My poor camera barely had the ability to catch him. And he was close. A footstep away, an arm's length. Half a blink, and he was gone, powering away. Twenty-five minutes later, Bradley Wiggins made history, blasting into Hampton Court Palace nearly two minutes ahead of his nearest rival. A gold medal, his fourth, not quite a month after he became the first Brit to win the Tour De France. Either one would make for a lifetime's achievement. Together--well, let's just say the BBC Sports Personality Of The Year Award is something of a one horse race this year. By that point, we were back at home base, popping the champers, raising a glass as Bradley conducted the masses in the National Anthem. The sun was out, and all of a sudden it was very, very nice to be British. For more pics of the day, check out TLC's Flickr set. If we're going to be honest with each other, global fashion is not the most sustainable of industries. It's based around heavy transportation footprints, nearly unfettered use of toxic chemicals and a pitifully poor record on worker's rights. Things are improving, of course. I wouldn't be here if that wasn't the case. One of the main reasons that things are slowly getting better is that it's becoming easier to track and measure how ethical and sustainable you are as a company. That process is about to become easier still, with the introduction of the Higgs Index. Nothing to do with the Large Hadron Collider, this is a three-part scoring system that aims to allow companies to easily measure the environmental performance of their apparal online. It tracks three seperate metrics. A brand module looks at how goods are designed, and whether their life cycle, transportation and the use of toxic nasties have been taken ino account. A product module looks at the sustainability of fabrics, cutting-room waste and the use of potentially harmful finishes. Finally a facilities module examines the factory itself, and how it deals with waste water and energy use. The Higgs Index has already been tested by big hitters like Nike, Adidas and American big-box store J.C. Penney. But the ultimate plan would be to make the tool available to anyone, allowing consumers to see at a glance just how sustainable an item of clothing is. It's easy to brand something as "eco-friendly", but there's often litte explanation of what that means. Imagine if we had a clear, understandable certificate of sustainability, like a Food Standards Agency rating on a restaurant. That would really force manufactrers to up their game. Take a look at the Higgs Index yourself, at the Sustainable Apparel Coalition website.